Our work flow begins with a consultation, initial concept design and planning. Value: $440 + travel costs. Talk to us, we can work with your budget. Hardy food-producing native plants with reduced operational costs. Native fruiting plants are the future of food! There are spots on your land perfect for planting. 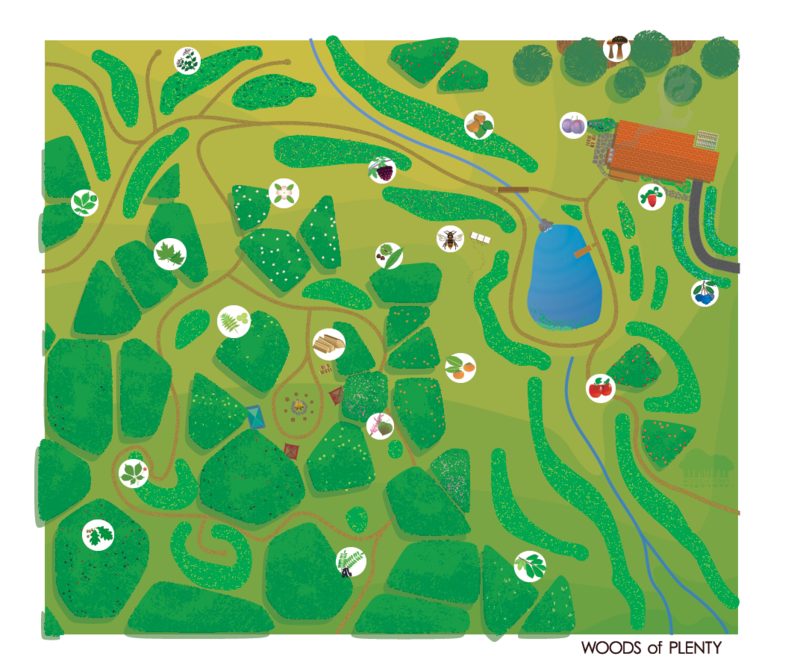 Woods of Plenty brings the magic back to hard-edges for abundant food production! Have an old orchard being dragged down by invasive plants? Chances are, it's still producing nice fruit! Best part is, the lack of management over the years means non-toxic food. Minimize future work and create form through plant propagation and the utilization of other resources on site. These installations capture life's most precious resource and provide habitat for pollinators. Around the house there are opportunities to incorporate perennial garden crops into existing garden beds and to establish new beds for planting. Let us know what you want to attract and we can develop habitat to suit their needs. Be guided to places of interest in your forest. We can design and establish a comfortable camp site for you and your crew to enjoy life outdoors. Features include: Seating, native grass bedding, firepit, windbreak trellises, nooks for tents, sawdust toilet, and fruiting trees. A great starting point to drastically improve tree health. 1 acre dense with vines can be cut in 2 hours. We make about 1200 vine cuts per hour (we've counted). Deploy Woods of Plenty to a specific region of your land to usher in a new era of abundance.